Director of Analytics and Reporting for the Manufacturing and HR Divisions for Pfizer Inc. for 22 years. Led a team of 25 including both Contracted Resources and Pfizer Colleagues in the roll-out of Analytical Systems worldwide. Member of several Sweet Adelines Choruses and Quartets over the last 45 years with Sweet Adelines, including Ramapo Valley Chorus, City Lights, and The Buzz. Was a board member for Ramapo Valley as well as on the Regional Convention Committee for Region 15. I coach choruses and quartets on a regular basis. I just completed a 3 year term on the Coronet Club Board as Secretary for the first 2 years and Vice President for the most current year. I am involved in my church activities and also a member of my church choir. I love doing mathematical puzzles and I have recently started teaching myself piano! It's a slow and tedious process but I am loving it! Director position/numerous Nursing Leadership positions, Chorus Director/Leadership BOD member, CC BOD member. 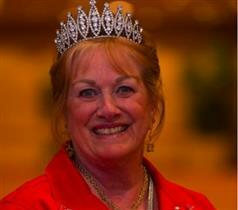 Kansas City Chorus member and Director, 2010 International Quartet Champion, Approved Showmanship Judge Candidate. I am a very organized person and enjoy administrative tasks. I also believe in integrity, reliability, accuracy and a positive attitude. I have been in the office environment as an administration/receptionist when employed for the last 20 years. Also while living in Texas, served on the Region 10 Regional Management Team for 7 years. I served on the Coronet Club Board from 2015 to 2017 and as ticket Chair 1993 to 1995 and 2015 to present (2018). Have been a member of Sweet Adelines since June 1977 and have served as Assistant Director and Tenor and Bass Leader many times throughout my membership. I also did some coaching during that time. Reading, Gardening and being with family.